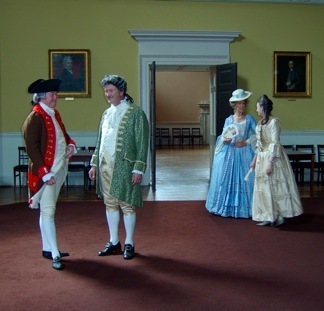 Bath Minuet Company is a performance dance group specialising in the recreation of the social and court dance of the eighteenth century. The company is based in the Georgian City of Bath and has been performing for over twenty years at public festivals, corporate events and private functions. Many performances are given at historic locations. Past venues have included Hampton Court palace and Waddesdon Manor in addition to Bath landmarks such as the Assembly Rooms, Pump Room and Guildhall. The company also performs for film and television. The company pay great attention to detail in costume, manners, and above all, dancing. We aim to demonstrate to our audiences, the elegance, the grace of movement and the harmonious patterns, which characterise baroque dance, and to illustrate the way in which these qualities reflect the aesthetic values of the period, as expressed through the music, architecture and visual arts. The company is available for bookings throughout the year and can tailor performances to suit any occasion.